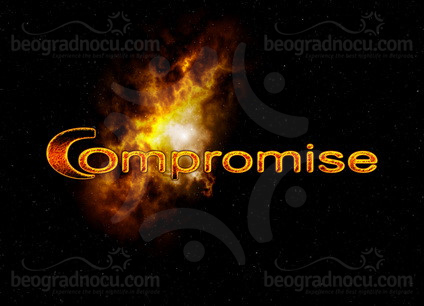 Club Compromise is one of recently opened clubs in Belgrade with great service and excellent atmosphere. Club Compromise is a unique place in town. The club opens its door every day at 8 am as a coffee bar, where you can have soft drinks and eve have something to eat. On Saturday night interior of club is changed with bar tables with live performances and party starts at 11 pm and lasts until morning. Club Compromise is located in Vračar, in No 189 Gospodara Vučića Street, near soccer stadium Obilić. This club even has private parking with video surveillance and the full capacity of 200 vehicles. The curiosity of this place is that this club is only club in Belgrade where you can spend the night, since there is a hostel right above it. Of course with affordable prices. Club Compromise is ideal for organizing birthday parties, proms and any type of celebration. Considering everything, club Compromise is an excellent getaway from city crowd, where you can enjoy, relax and recharge ‘batteries’, and still be in down town.